This wonderful luxury camping site is located on the Cecina Mare coast in the world-famous area of Tuscany. Known for its stunning landscapes and historical towns, this region is ideal for a camping holiday as it is only a short distance from Florence, Pisa and Siena. 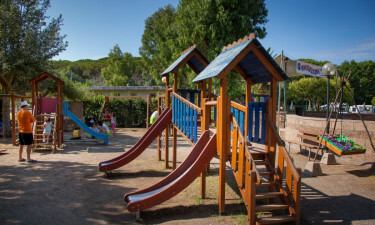 This well-equipped campsite bookable through LuxCamp is only a short walk from the beach, making it the ideal space for both activities and relaxation. Book your trip to this special spot today. 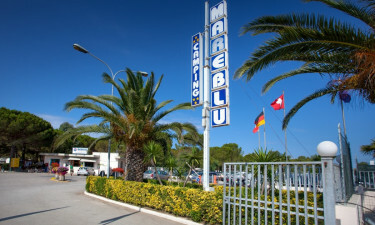 Although the surrounding area is beautiful, Mareblu has everything you need on site. From the comfort of a mobile home, you can unwind among the pine tree forest. The luxury camping experience is completed with evening entertainment and a butcher, grocer, and supermarket. This campsite has a range of activities for the whole family. You'll never get bored at Mareblu! The site has a large main pool as well as a smaller pool for little ones. There are plenty of lounging areas around the complex for sunbathing and resting. A white sandy beach is only a short stroll away from the camp. This spacious beach has a range of loungers and sunshades that look across the sparkling Ligurian sea.